In an age when Recruiters have more options to them than ever before, we can consider ourselves lucky for the LinkedIn, Twitters and Facebooks of the world. Where professional networking used to be confined to conferences, professional development events and User Groups, we Recruiters find ourselves in a golden age of networking. Indeed, professional networking is taking place at all the old classics, but now the realm of online social networks has been opened up to those brave (and industrious souls) willing to cross through that door. But buyer beware…as in all things, some bad comes along with the good. When we begin to blur the line between our social selves and our professional selves there are some pitfalls along the way. One of the newest hazards to hit the online networking arena is the blurred relationship between the professional online networks and the social ones. As we all know, there are a number of competing professional networking sites. In fact, those sites have become one of the hotbeds of so-called passive candidates and a great place for recruiters to build their own professional profiles. But now there are ways to blend our professional networks with some of the more socially focused ones. A number of professionals, recruiters included, have begun to list their Twitter, Facebook or FourSquare accounts as part of their professional profile. Now while some of the benefits are obvious (increased capacity, more candidates, greater audiences) some of the drawbacks are equally as obvious. Do you want your candidates and clients knowing the stores, restaurants or entertainment venues you frequent? Do you have friends tagging you in old college photos better left to the past? What about this (likely familiar) scenario? A client or candidate ‘friends’ you. What to do, what to do? As can often happen in this business, the line between colleague and friend becomes obscured. In some cases, the candidate or client feels a connection or friendship that may not be there. 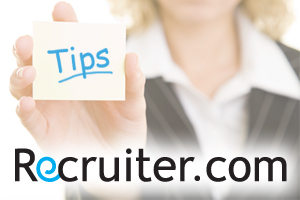 In still others, after a period of working together a Recruiter and candidate may actually have become friendly. But always bear in mind that this is a business and you are your own product. People don’t work with recruiters (at least not on a repeat basis) because they like them as a person…they work with the professional that delivers results. If they have even a passing hint that you are or may have been a train wreck, there is no way they’ll stake their career on you. So how do you increase your networking with valuable sources like Twitter and Facebook without risking your privacy or past? There are a few tricks that any recruiter should have up their sleeve. Using a social networking site as a recruiting tool can be tricky, but if you want the best of both worlds, cheat a little. Open two accounts; one can make you easy to find, while the other is reserved for friends and family who know where to look. John L. Michael versus John Michael for instance. Also, check your privacy and security settings often! Keeping your privacy settings dynamic so that you control who sees what is key to maintaining some level of control over your privacy. And of course, the Golden Rule of social recruiting: What Would Grandma Do? If your poor Grandmother would faint (or lecture you on the Greatest Generation) because of what you’re posting or tweeting…play it safe(r). One thing to note is that both Linkedin and Facebook prohibit dual accounts – they don’t allow you to register two accounts and you could (theoretically) get yourself banned. You might consider reserving one service for professional and one for personal – however, split your names and don’t connect the two, so that your personal account is hard to find through a general public search. So while the golden age of recruiting is upon us and great candidates are out there just waiting for you to find them, make sure you’re leveraging those social networks the right way. While they can be excellent tools that open the floodgates of new candidates, clients and colleagues, they can also be a hazard to your professional reputation. As fun and dynamic as our business is, it is a business. So keep those floodgates open…just make sure you’re doing it (as in all things) like a professional.